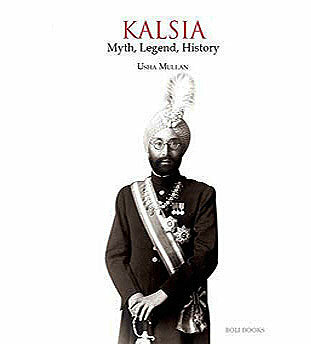 Kalsia: Myth, Legend, History, captures a broad swathe of North Indian history through text and illustrations, covering 3,500 years as seen through the constant lens of one family’s ancestry. From its roots in Indian mythology and the early Vedic period, the family’s lineage is traced back to the kings of the SuryaVansh and ChandarVansh, and subsequently within theYadavVansh whose 56 tribes were said to have been organised by none other than Lord Krishna at the time of the Mahabarat wars. Then, from Raja Gajj, the “King of the East” and the founder of Ghazni, its forty-one generations run parallel with the births of Buddhism and Jainism, the invasion of Alexander the Great, through to the thirty-five year reign of Emperor Asoka. The Bhatti Rajputs, precursors of the Kalsia Jats, originate roughly halfway through the first millennium CE, about the time of Harsha of Kanauj. Some twenty-four generations later, as Bhattinda is lost to Ala-ud-Din Khilji, the family is aligned away from the Bhatti Rajputs and with the Jats. Some two hundred years later, as the Lodi Dynasty gives way to the Mughals,and Sikhism is born, the family led by its then chief, Kalsi, arrives in KalsianKalan (near Amritsar)and creates a settlement Kalsiabad from which the family takes its name. The family tree shows how all 200 or so generations are aligned along the timeline of Indian history with a detailed focus on the last nine Kalsia rulers.